One most revered commenter on my most amazing post yesterday indicated that he was somewhat confused by the chaotic brilliance of my theory. Fair point. So today, I’m breaking it down with fewer links. The second angel sounded his trumpet, and something like a huge mountain, all ablaze, was thrown into the sea. A third of the sea turned into blood, a third of the living creatures in the sea died, and a third of the ships were destroyed. The third angel sounded his trumpet, and a great star, blazing like a torch, fell from the sky on a third of the rivers and on the springs of water–the name of the star is Wormwood. A third of the waters turned bitter, and many people died from the waters that had become bitter. Furthermore, as mentioned in my comments on the Other Post, Canadian rivers are actually turning neon green. Please note that as Kullervo has so helpfully pointed out, this raises the strong possibility that we are in the midst of a Mister Spockalypse. Either way, you canNOT deny that we totally heard the Third Trumpet sound and we didn’t even know it. So this brings me to my point. A few years ago, there was significant concern about mass bee colony collapses. As far as I know, this phenomenon has yet to be fully explained (despite several theories). 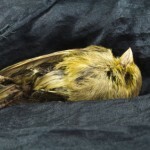 Were the bees our canary in the coal mine??? And are birds the new canaries? Okay, seriously now…is that river thing for real?